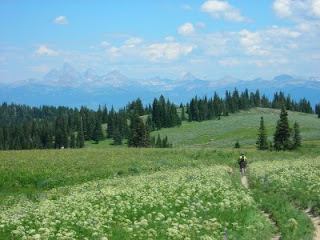 Alaska Basin is one of the most beautiful destinations in the Teton mountain range, or anywhere else for that matter. 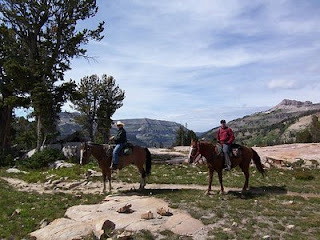 It's a nice half-day trip from the Teton Canyon trailhead, and we made the journey via horseback this week. 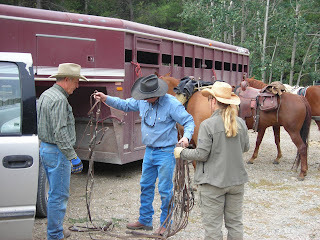 It happened to be my birthday week (let's just say I'm well past 21, so it wasn't real exciting), and I had promised Joanne I'd join her and a couple of good Driggs cowboy friends for the big horseback ride. It ended up being the one cloudy day we've had in the past three weeks, but it was still epic. 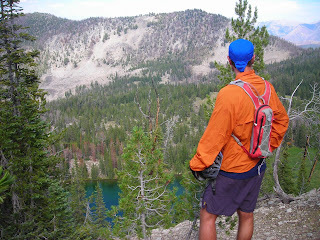 I made things interesting by trail running about half the distance, and really liked that mix. 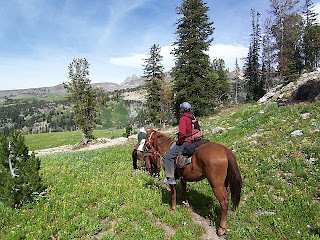 I would've had a tough time running or riding a horse the entire 18 miles round-trip, but half of each was perfect. 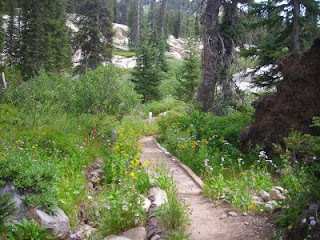 Flowers were peaking around the 9,000 foot elevation mark, which is amazing considering it's the end of August. Alaska Basin sits at nearly 10,000 feet, and has only been snow-free for a little over two weeks. Snow is predicted for this coming Monday (Labor Day), which means the summer season up there will be a grand total of three weeks. Brutal! 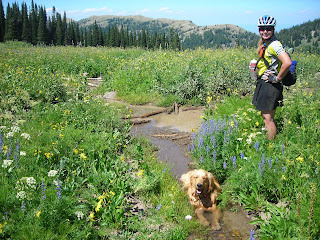 Joanne, Bridger and I all love the high country. Bridger couldn't decide which lake or stream to swim in, while Joanne and I couldn't decide which mountain peak was most dramatic. We eventually determined that from our particular vantage point, it had to be Buck Mountain. 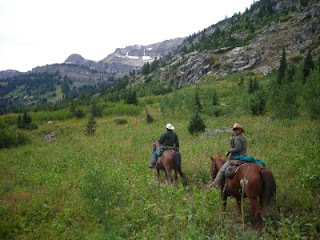 I love spending days in the backcountry with Weston. 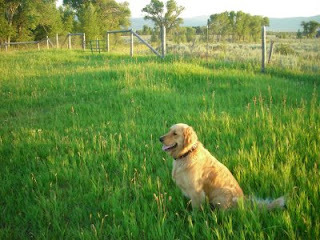 He knows every mountain, stream, hill and tree surrounding Teton Valley, and has a story associated with most of them. He was exploring this area long before they created the Jedediah Smith Wilderness Area, and in his words it was more "wild" before (statistically, he's right: once an area is named "Wilderness," visitation increases significantly). Go figure. 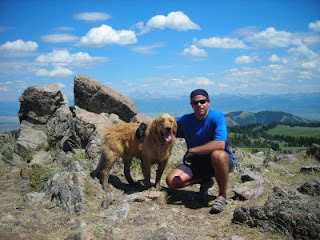 On our return trip, Weston guided us on a little-known trail that presented the most majestic views of the day. It's an honor to be out there on a horse with the man, and he's way better than a GPS. They're not making 'em like him anymore. 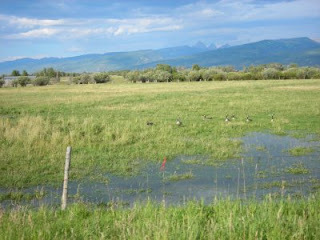 As August winds down, there's suddenly a hint of fall in the air here in Driggs. 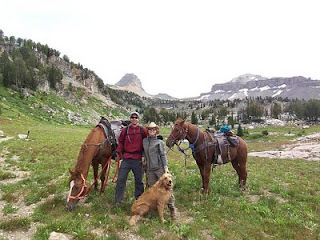 It creates a sense of urgency to get out and tackle that last epic hike, or float down the river, or backcountry horseback ride. It also gives me reason to sort through some of my favorite photos from this summer. 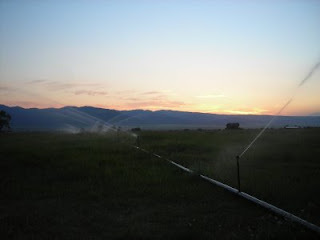 Moving sprinkler pipe down at the pasture has provided some memorable evening scenes. I love the unique combination of rural, agricultural, and mountain resort town feel we enjoy here in Teton Valley, Idaho. Not many places remaining like this. 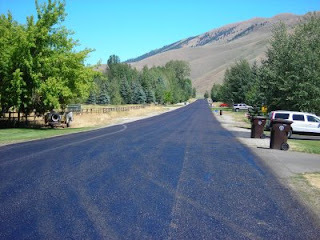 The development slow down has indeed hit the local Driggs economy, and it's been felt by most of us. But, there are a few upsides...such as plenty of room and good deals on the high-end golf courses. 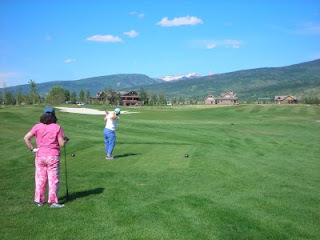 We took advantage and enjoyed a nice round at Teton Reserve with mom and dad when they visited back in July. Bridger has slowly but surely been coming of age this summer, thank goodness. He still has his spastic moments (yet in fairness, so do the rest of us), but we occasionally catch him in fairly regal poses, which gives us hope. All it takes is lots of patience, and miles and miles of exercise every day. 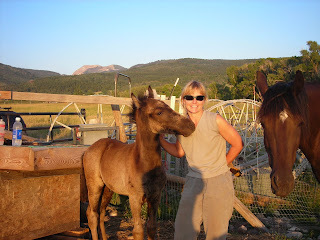 The birth of our baby colt Slate back on Memorial Day was a highlight of the summer, for sure. He's growing fast, and remains incredibly friendly and fun. You can see the intelligence and kindness in his eyes...he's a keeper. If anything stands out from this summer, it has to be the phenomenal wildflowers (I guess that's the reward for enduring snowstorms every week from November through mid-June). 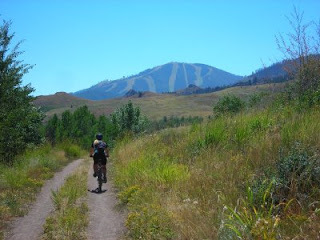 They were so spectacular, it was often hard to keep your mountain bike on the trail. If you can't beat 'em, join em! 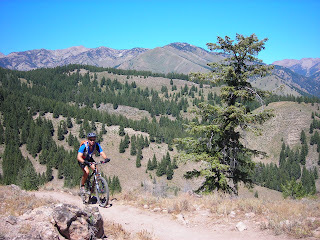 Mountain biking to the top of Garns Peak has become an annual summer quest. To the west of Driggs, it measures just over 9,000 feet and is the highest point in the Big Hole Range. 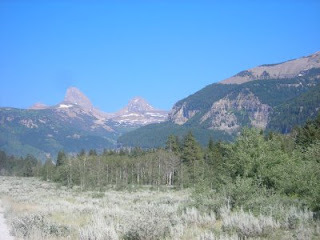 The summit affords views of the Tetons to the east, Palisade Range to the south, and Kelly Canyon to the west. The trail itself is off-the-charts difficult (at least without a motor), with 3,000 feet of technical climbing, but the sense of accomplishment and payoff views are well worth the suffering. Besides, as Lance says: "I'm just not happy if I don't suffer a little every day." I concur. We decided to bring Bridger along for the experience today, and put his energy to the test. He was a champ. Prolonged water submersions and snowbank breaks added time to the outing, but we had to keep him cool out there. 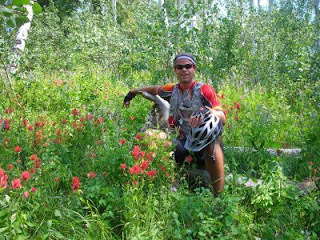 He's quickly catching on to trail manners, both on horse rides and mountain bike rides, and seems to be improving his "smile for the camera" talents, too. First things first. 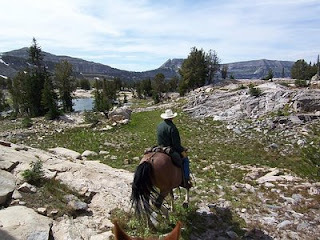 I have always loved the Elk Flats area, which is an enormous meadow just below Garns Mountain. The wildflowers were incredible today, still peaking in August! The snow has only been gone from that area for a couple of weeks, and resulting melt-off is producing great high country stream flow. I considered joining Bridger in this watering hole, but Joanne and warmer heads prevailed. It's a long way from there back to the car. 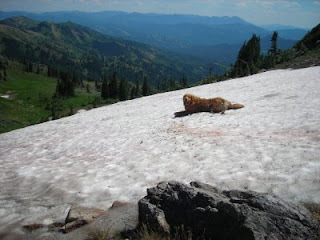 Bridger in his element, on the largest remaining snowfield just below the summit of Garns. 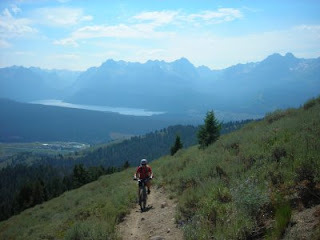 This is looking south across the Big Hole Range, an absolute mecca of trails. 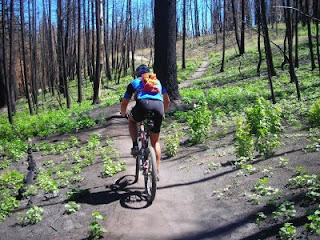 Today, we only passed a few dirt bikers and horses...zero other mountain bikers or hikers. If you've ever got the time, I've got endless adventure stories from this country (mountain lions, bears, hiking out after dark, being attacked by sheep dogs, and I keep coming back!). Not a bad backyard.